either of two large organs lying within the chest cavity on either side of the heart; they supply the blood with oxygen inhaled from the outside air and dispose of waste carbon dioxide in the exhaled air, as a part of the process known as respiration. Other functions include filtration of blood, serving as reservoirs to store blood, and playing a role in metabolic activities. See also color plates. The lungs are made of elastic tissue filled with interlacing networks of tubes and sacs carrying air, and with blood vessels carrying blood. 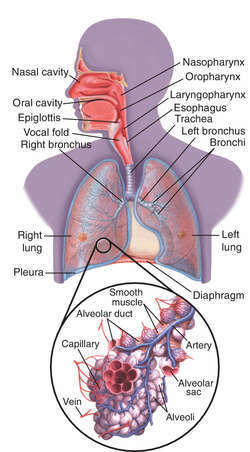 The bronchi, which bring air to the lungs, branch out within the lungs into many smaller tubes, the bronchioles, which culminate in clusters of tiny air sacs called alveoli, whose total runs into millions. The alveoli are surrounded by a network of capillaries. Through the thin membranes of the capillaries, the air and blood make their exchange of oxygen and carbon dioxide. The lungs are divided into lobes, the left lung having two (the left upper lobe and the left lower lobe) and the right having three (the right upper lobe, the right middle lobe, and the right lower lobe); these are further subdivided into bronchopulmonary segments, of which there are about 20. Protecting each lung is the pleura, a two-layered membrane that envelops the lung and contains lubricating fluid between its inner and outer layers. Mechanics of Inflation and Deflation. The lungs are inflated by action of the diaphragm and the intercostal muscles. The diaphragm, a large dome-shaped muscle, forms the bottom of the thoracic cage. As it contracts it flattens, increasing the diameter of the thorax and elevating the lower ribs. Both of these actions increase the space for expansion of the lungs. The external intercostal muscles provide flexibility to the thoracic cage and allow more room for lung expansion by elevating the anterior end of each rib, thereby increasing the anterior-posterior diameter of the chest wall. Deflation of the lungs is chiefly a passive maneuver. The major muscles involved in exhalation are the abdominal muscle group. As these muscles contract, they depress the lower ribs, and, through an increase in abdominal pressure, move the diaphragm upward. As the lungs are compressed and distended by the respiratory muscles, the pressure within the alveoli (intra-alveolar pressure) rises and falls. During inhalation the pressure becomes slightly negative (−3 mm Hg) in relation to atmospheric pressure. During exhalation the intra-alveolar pressure rises to approximately +3 mm Hg. The effect of negative pressure within the alveoli is to cause air under atmospheric pressure to flow into the lungs (inhalation). The condition of positive pressure creates the opposite effect, causing air to flow outward (exhalation). The lungs are surrounded by an airtight compartment, the pleural space within the pleural membrane. The intrapleural pressure is less than atmospheric pressure and is expressed as negative pressure. Normally the intrapleural pressure is about −4 mm Hg. When the lungs are fully expanded this pressure may be as great as −9 mm Hg. Under normal conditions, however, the intrapleural pressure fluctuates between −4 and −6 mm Hg. Disorders of the Lungs. The air brought to the lungs is filtered, moistened, and warmed on its way along the respiratory tract but it can nevertheless bring irritants and infectious organisms, and when the body resistance is low for any reason the lungs may suffer diseases of some seriousness. Such diseases include tuberculosis and pneumonia. Other disorders of the lungs include pulmonary edema, pleurisy, asthma, bronchiectasis, atelectasis, emphysema, and pneumoconiosis. Still other diseases enter the lungs via pathogens in the circulation, and the lungs may also be affected by pulmonary embolism and chronic obstructive pulmonary disease. 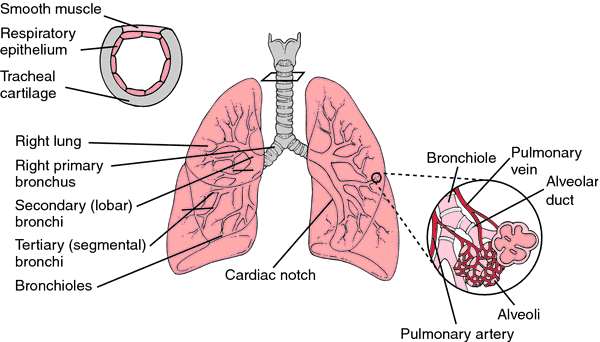 Structure of the lung. From Applegate, 2000.
lung abscess an infection of the lung, characterized by a localized accumulation of pus and destruction of tissue. It may be a complication of pneumonia or tuberculosis. A lung abscess may also follow a period of excessive drinking by an alcoholic. Infected matter that has been aspirated (usually in a drunken stupor) may lodge in a bronchiole and produce inflammation. Lung cancer may also be responsible for formation of an abscess. The first symptoms include a dry cough and chest pain. Later these may be followed by fever, chills, productive cough, headache, perspiration, foul-smelling sputum, and sometimes dyspnea. If the abscess is a complication of pneumonia, the symptoms tend to be moderated to an exaggeration of the pneumonia symptoms. When a lung abscess forms, it is in the acute stage and treatment with antibiotics usually is effective. postural drainage may be prescribed to assist in drainage of exudate from lungs and bronchioles. In most cases, this treatment produces a cure. If the abscess becomes chronic, surgery may be necessary and usually involves removal of the portion of the lung containing the abscess. bird breeder's lung pigeon breeder's lung. black lung coal workers' pneumoconiosis. lung cancer malignant growths of the lung. Although the exact cause of lung cancer is not known, inhaled carcinogens are known to be important predisposing causes. Cancer in the lungs may also be a metastasis of malignancy elsewhere in the body. Many years ago it was realized that miners of certain ores who inhaled the mine dust developed lung cancer much more often than workers in other occupations. Later, other carcinogens of lung tissue, such as air polluted by fumes from burning fuels or motor exhausts, were singled out as probable causes of the increasing number of cases of the disease in urban and industrial areas. The most obvious carcinogen, however, and the one most widely encountered, is tobacco smoke, especially cigarette smoke, which is much more frequently and deeply inhaled than the smoke of pipes or cigars. Since the factors causing lung cancer act slowly and may produce a tumor near the periphery of the lung, early symptoms are vague or may not appear at all, and nearly a third of the cases are in an advanced stage when they are discovered. The earliest and most common symptom is a cough. Dry at first, this cough later produces sputum, which eventually becomes blood-streaked. An isolated persistent wheeze in the chest is frequently a symptom and indicates a partial obstruction in a bronchus. Chest pains, weakness, and loss of weight are later symptoms, as is dyspnea. Diagnosis depends on a careful physical examination, including a chest x-ray. If a suspicious density is seen on the x-ray, samples of sputum will be examined microscopically for the presence of malignant cells. bronchoscopy is also done, and at the same time a specimen for biopsy can be obtained or the bronchial secretions can be washed out and the cells stained and examined. When examination indicates lung cancer, prompt treatment is essential. This may involve the surgical removal of the lobe of the lung containing the cancer or of an entire lung if the malignant cells have spread. A significant number of persons affected by lung cancer can be cured by such operations if the surgery is performed in time. In some cases of widespread involvement surgery is not possible; these patients are treated with radiation therapy and antineoplastic drugs. Carcinogens that can trigger lung cancer must be avoided and, when possible, eliminated. Mine workers should take adequate precautions to avoid inhaling harmful dusts. Public health authorities and industry must act more effectively to control air pollution. The most important step toward protection against lung cancer is elimination of cigarette smoking. State and local units of the American Lung Association are excellent sources of information about lung disease and its prevention. Lung cancer clinical guidelines have been published in both the United States and Canada. In Canada they are available at the web site of Cancer Care Ontario, http://www.cancercare.on.ca. and in the United States they are available at the web site of the National Guideline Clearinghouse, http://www.guideline.gov. coal miner's lung coal workers' pneumoconiosis. farmer's lung hypersensitivity pneumonitis caused by inhalation of moldy hay dust. iron lung popular name for Drinker respirator. pigeon breeder's lung hypersensitivity pneumonitis caused by inhalation of particles of bird feces, seen in those who work closely with pigeons or other birds; it may eventually result in pulmonary fibrosis. shock lung acute respiratory distress syndrome. 2. acute respiratory distress syndrome. a mechanical respirator in which the body (except the head) is encased within a metal tank, which is sealed at the neck with an airtight gasket; artificial respiration is induced by making the air pressure inside negative. An airtight metal tank that encloses all of the body except the head and forces the lungs to inhale and exhale through regulated changes in air pressure. A mechanical ventilator in which the body except the head is encased within a metal tank, which is sealed at the neck with an airtight gasket; artificial ventilation is induced by making the air pressure inside the tank alternately negative and positive. Either of two cone-shaped spongy organs of respiration contained within the pleural cavity of the thorax. See: illustration; alveolus for illus. The lungs are connected with the pharynx through the trachea and larynx. The base of each lung rests on the diaphragm, and each lung apex rises from 2.5 to 5 cm above the sternal end of the first rib, the collarbone, supported by its attachment to the hilum or root structures. The lungs include the lobes, lobules, bronchi, bronchioles, alveoli or air sacs, and pleural covering. The right lung has three lobes and the left two. In men, the right lung weighs approx. 625 g, the left 570 g. The lungs contain 300,000,000 alveoli and their respiratory surface is about 70 sq m. Respirations per minute are 12 to 20 in an adult. The total capacity of the lung varies from 3.6 to 9.4 L in men and 2.5 to 6.9 L in women. The left lung has an indentation, called the cardiac depression, for the normal placement of the heart. Behind this is the hilum, through which the blood vessels, lymphatics, and bronchi enter and leave the lung. Air travels from the nasal passages to the pharynx, larynx, and trachea. Two primary bronchi, one on each side, extend from the trachea. The primary bronchi divide into secondary bronchi, one for each of five lobes. These further divide into a great number of smaller bronchioles. The pattern of distribution of these into the segments of each lobe is important in pulmonary and thoracic surgery. There are about 10 bronchopulmonary segments in the right lung and eight in the left, the actual number varying. There are 50 to 80 terminal bronchioles in each lobe. Each of these divides into two respiratory bronchioles, which in turn divide to form two to 11 alveolar ducts. The alveolar sacs and alveoli arise from these ducts. The spaces between the alveolar sacs and alveoli are called atria. In the alveolus, blood and inspired air are separated only by the cell of the alveolus and that of the pulmonary capillary. This respiratory membrane is thin (0.07 to 2.0 µm) and permits oxygen to diffuse into the blood and carbon dioxide to diffuse from the blood to the air. The lungs are innervated by parasympathetic fibers via the vagus nerve and sympathetic fibers from the anterior and posterior pulmonary plexuses to the smooth muscle in the walls of the bronchial tree. The bronchial arteries and veins circulate blood to the bronchial tree. The pulmonary arteries and veins circulate the blood involved in gas exchange. Inspection: The examiner determines the respiratory rate by unobtrusively watching the patient's chest rise and fall and counting the number of breaths per minute. In adults a normal respiratory rate at rest is about 12 breaths per minute. While counting the respiratory rate, the examiner can observe other breathing characteristics. Dyspneic patients breathe rapidly, often laboring to draw breath even when at rest. Retractions of the intercostal and supraclavicular spaces are visible during inspiration. Sleep apnea is characterized by episodes of stalled breathing followed by periods of respiratory compensation. Regular slow breathing is normal. Palpation: In health, the chest and lung transmit a vibration, called fremitus, during speech. Fremitus abnormalities may be felt in chronic obstructive lung diseases or obesity, in which the vibration is diminished, and in pneumonia, in which it is increased over the infected lobe. Percussion: Tapping on the chest wall over healthy lung results in a hollow resonant sound. The hollow character of the resonance sometimes is exaggerated in emphysematous lungs or in pneumothorax, and muffled by pleural effusions or pulmonary consolidation. Normal breath sounds: In the healthy person, breath sounds are low-pitched and have a frequency of 200 to 400 cycles per second (cps); frequency rarely exceeds 500 cps. These sounds are called vesicular breath sounds when heard over the lungs. They are produced by air passing in and out of the airways. Bronchial and tracheal breath sounds: These are higher-pitched and louder than vesicular sounds, and are produced by air passing over the walls of the bronchi and trachea. These sounds are normally heard only over the bronchi and trachea. Amphoric and cavernous breathing:These two nearly identical sounds are loud, with a prolonged, hollow expiration. The pitch of amphoric breathing is slightly higher than that of the cavernous type, and may be imitated by blowing over the mouth of an empty jar. It is heard in bronchiectatic cavities or pneumothorax when the opening to the lung is patulous; in the consolidation area near a large bronchus; and sometimes over a lung compressed by a moderate effusion. Harsh inspiratory sounds are typical of stridor, a medical emergency. Expirations that are prolonged and musical are characteristic of wheezing. Friction: This sound is produced by the rubbing together of roughened pleural surfaces. It may be heard in both inspiration and expiration. Friction often resembles crackle, but is more superficial and localized than the latter and is not modified by cough or deep inspiration. Metallic tinkling: A silvery bell-like sound heard at intervals over a hydropneumothorax or large cavity. Speaking, coughing, and deep breathing usually induce this sound. It must not be confused with a similar sound produced by liquids in the stomach. Crackles: Abnormal bubbling sounds heard in air cells or bronchi. Succussion-splash or hippocratic succussion: A splashing sound produced by the presence of air and liquid in the chest. It may be elicited by gently shaking the patient during auscultation. This sound nearly always indicates either a hydropneumothorax or a pyopneumothorax, although it has also been detected over very large cavities. The presence of air and liquid in the stomach produces similar sounds. An allergic inflammation of the lung due to exposure to bird excreta. In some patients the onset is slow rather than acute. Symptoms include chills, fever, cough, and shortness of breath and usually subside when exposure to the antigen ceases. The shredding-type effect that takes place in the alveolar surfaces of the lung caused by the shock of an explosion or blast, which can cause alveolar contusion. An allergic respiratory condition caused by the mold Aspergillus. A colloquial term for a lung with increased markings in its interstitial tissues, usually identified in smokers. A form of hypersensitivity alveolitis caused by exposure to moldy hay that has fermented. Actinomyces micropolyspora faeni and Thermoactinomyces vulgaris are the causative microorganisms. Interstitial lung disease that results from the inhalation of airborne nylon fibers at work. Nylon fibers are used in making products for upholstery, automobiles, carpet, and apparel. A type of silicosis found in granite miners after exposure to and inhalation of dusts. An abnormal appearance of the lungs seen on chest x-ray exam, in which small cystic spaces alternate with coarsely increased interstitial markings. This pattern is typical of pulmonary injury caused by inhalation of dusts, minerals, toxic gases, or fibers; rheumatological diseases; and interstitial pneumonitis. A hypersensitivity pneumonitis typically found in agricultural workers exposed to Aspergillus clavatus spores in barley and other grains. Lung that cannot expand and contract during respiration because it is restricted by the visceral pleura. A now obsolete device used to maintain breathing in patients with paralysis of respiration. It consisted of a coffin-like metal box in which the patient lay with only the head protruding, and with an air-tight seal around the neck. Air was pumped in and out of the box at the normal breathing rate, causing the patient's chest to expand and collapse. The iron lung has long been replaced by much more portable and less restricting positive pressure pumping equipment. Philip, U.S. industrial hygienist, 1894-1972.